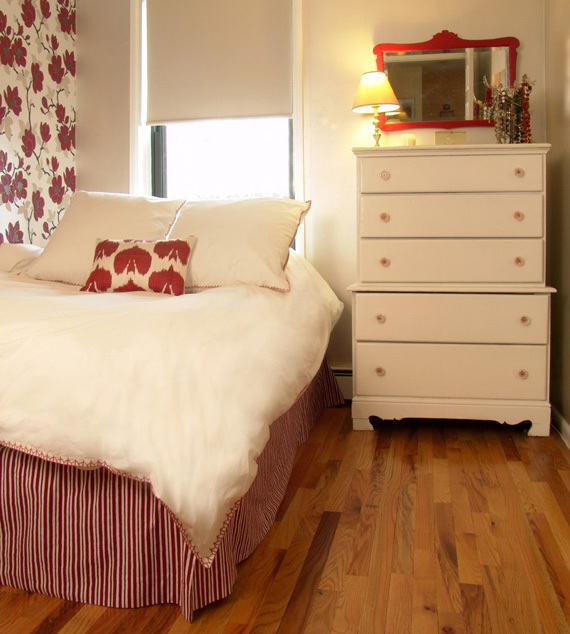 This bedroom design was born out of a mix-up—and I’m thrilled with the mistake. With a coat of Benjamin Moore’s metallic Veil Cream, these walls have a subtle sparkle in the sun and warm glow by lamplight. 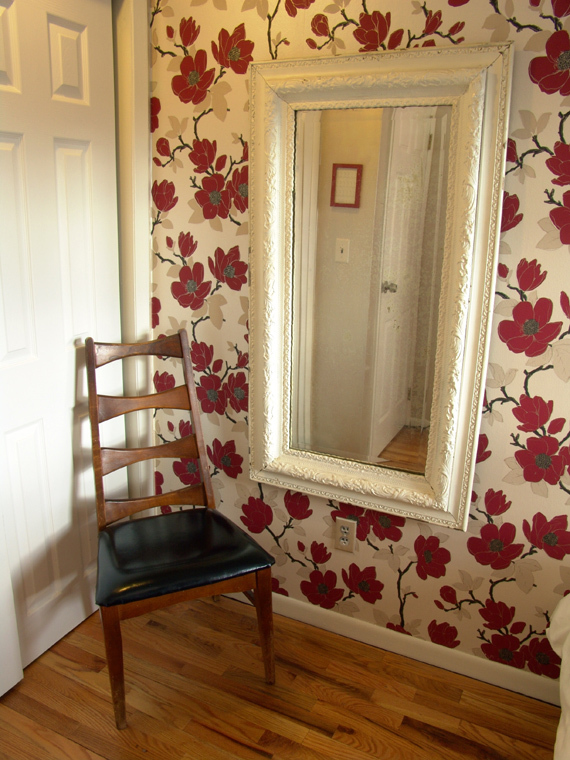 It’s the prettiest paint and was intended for all four walls—but in efforts to save an unused roll of wallpaper (see the bathroom blog for full explanation), the fourth wall is now covered in a red magnolia print that brings the room to life. White walls and twin bed made this the loneliest room. The single sleeper did offer a bit of extra space, but mainly as grounds for clutter. The room was more like a walk-in closet and deserved to be made for guests. As I mentioned, this wallpaper by Graham and Brown was originally intended for the bathroom. But when I realized it was not made to take humid conditions, I became determined to find this hand-sketched floral design a new home. On the off-chance they would go together, I held this paper up to my freshly-painted guest bedroom walls and, amazingly, it couldn’t have been a better fit. The leaf design was the same color beige and it was accented with shimmering micas to give it the exact luster of the Veil Cream. The wallpaper was going up! 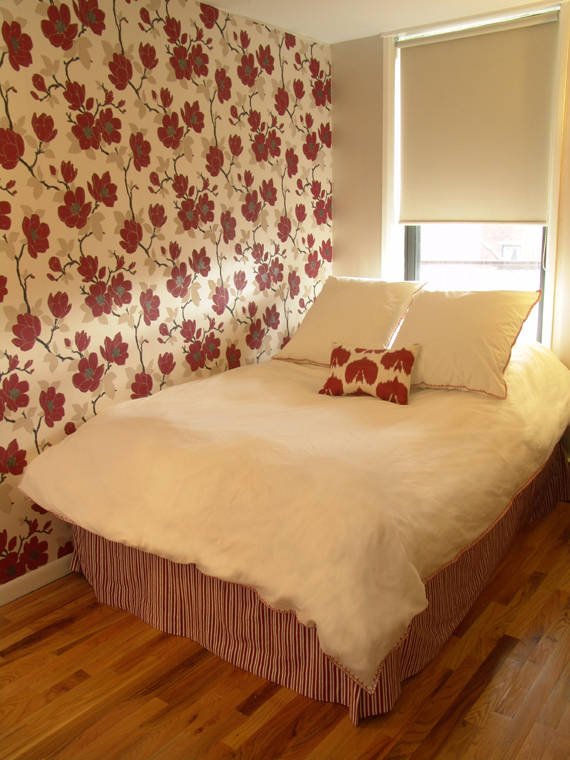 With a new red, cream and black palette on the walls, I was ready to pick the bedding. The paper is undeniably bold so all I needed for linens was a simple white with a touch of crimson—and John Robshaw’s line had just the thing. The hand-stitching around the border of this duvet is a subtle tie-in to the floral paper while the Gents Stripe bed skirt adds a nice contrast. 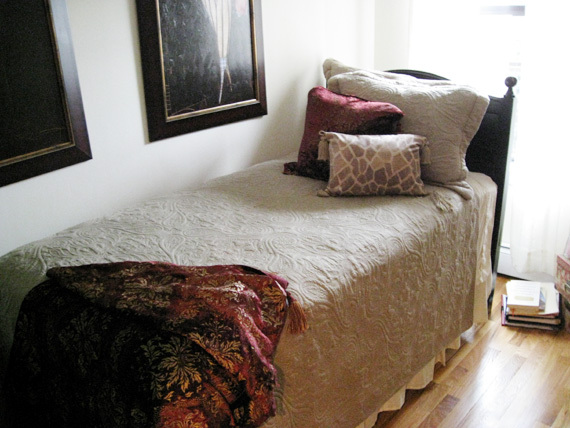 Then topped with one of Robshaw’s vintage ikat pillows and I made my perfect guest bed. Check back Wednesday, April 7 for the final makeover in the series…the living room.